"I feel less timid about glazes"
"A wealth of notes and a starting point for endless experiments"
"An understanding of line blends"
"I came with certain glaze goals and come away with many new ideas, understanding and so much else"
We gathered, that Monday morning, in the usual new group sort of way. Looking at each other, wondering why the other had come, apprehensive, eager. In no time at all we were making tiles and test pieces, extruding, looking at surface treatments, roulettes, rollers, slips and biscuit slips in preparation for an extraordinary week of exploration. Not least of which was a busy, risky but exciting schedule of biscuit firing, 2 gas kiln firings and a raku and smoke firing thrown in on our last evening. Our heads were filled with the glimmering of a new understanding of basic raw materials and of the infinite possibilities for each individual ingredient. Understanding ratios for making shiny, matt or dry glazes and the properties of a dolomite, magnesium or ash glaze made sense at last. We then started to glaze and for me, an opportunity to spray glaze for the first time and to do a series of mixing of my own glazes to use in line blends and test pieces. These activities were interspersed, firstly with a demo by David White decorating his majolica pieces with lovely fluid brush strokes and colour. 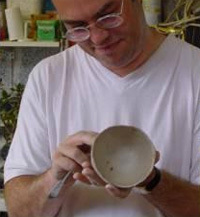 The next day a visit to Chris Jenkin's workshop where he generously shared many of his glazes with us. We also had the opportunity of seeing more of Jim's work - via one or two key sites from the filming of 'Last of the Summer Wine' at the Holmfirth Civic Hall and a magnificent seat/map in the centre of the town plus a visit to the North Light Gallery at Armitage Bridge. The whole week was one of intense activity with massive purpose and sharing of ideas, superbly guided by Jim and assisted by Ian Marsh. There was great generosity of spirit throughout and we were sustained par excellence by Liz with delicious lunches, the most welcome wine and nibbles stop at 6p.m. and later, dinner. Despite Jim's lack of sleep because of firing kilns on our behalf, his sense of humour did not diminish and the time was well laced with laughs. The week has left me very much more confident about my understanding of glazes and now I feel that I can read a glaze recipe more intelligently. There was good company, a sense of camaraderie, inspiration and, as one person said "the group mixed as well as the glazes". Thanks Jim, thanks Liz, thanks Ian - oh - and WE all slept well too! Friday evening on 21st October saw eight people with 'potting' experience ranging from beginner to professional gather at Booth House Gallery, Holmfirth, having enrolled on the first weekend extrusion course run by Jim Robison. The following day saw us all once again assembled in Jim's workshop, eagerly anticipating what we were going to learn. The morning was devoted to an in depth talk and demonstration by Jim on the various types of extruders available. Initially we looked at adapting readily available simple items like biscuit makers with pre-formed dies and icing bags with nozzles that could produce a variety of shapes. Jim also gave an overview of the commercial extruders and dies available, as well as a successful demonstration of his own innovative adaptation of a mastic gun that can be made into an excellent low-cost extruding device. We then learned how to make the dies for this using plastic card, drills and files. This was great fun. The lecture was accompanied by Jim's gentle sense of humour that still prevailed even when some demonstrations didn't go exactly according to plan! This helped everyone to relax and, in the long run, to learn much more. After lunch it was down to creating our own designs for extrusions and to making wooden dies for the shapes we envisaged. The making process obviously threw up some interesting problems but Jim was on hand to share his expertise and to provide assistance and suggestions for possible solutions. We then went on to produce extruded forms from our own dies and set about using them in creative ways, either as forms in themselves, or as rims for dishes, or feet and handles for pots and bowls. The mutual support and encouragement amongst the members of our group was a wonderful confidence-builder and we were justifiably proud of some of the work we produced. Another of Liz's delicious evening meals, accompanied by some good conversation that inevitably centred on 'potting' and potters, rounded off the day which all agreed had been very informative and productive. On Sunday morning Jim introduced us to a range of more complex dies, one of which he made and from which a hollow extrusion was produced. Even though there were some minor setbacks during the process, mainly to do with the flow of clay through the die, with Jim's help we were able solve the problem and finally achieved a good extruded piece. We also looked at some examples from Jim's gallery of work by other potters and the ways in which they had used extrusions. A demonstration by Jim followed, where he produced a piece from the largest of his commercial extruders and showed us ways in which the forms can be subtly altered and decorated. After lunch we worked on individual pieces and created our own ways of using and adapting the extruded pieces. We worked into the late afternoon before finally gathering round the table with a wonderful warm batch of Liz's home-made scones with jam and cream to keep us going whilst we evaluated the weekend and what we had achieved. The subject had produced a lively interchange of ideas, with a willing exchange of helpful suggestions and mutual support, and we all agreed that although intensive, we had all learned such a lot over the two days. The course also gave us the opportunity to try out the vast array of tools and machinery available in Jim's well-equipped workshop so that you could ascertain your needs before rushing out to purchase your own. Jim's expertise, his sense of humour and the friendly, informative atmosphere had also helped the whole weekend along. On a personal note, I feel I gained a great deal of confidence from the experience and couldn't wait to get home and try out my newly-acquired skills. I would like thank Jim for making the weekend go so well, Liz for providing great meals to feed the eight hungry potters and Ian Marsh for being on hand to provide help when and were it was needed. Overall an extremely enjoyable and value-for-money course that I wouldn't hesitate to recommend.